Whether you stack em up high or sport them individually alone, beautiful bracelets can be a jewellery piece that has the power to instantly bring a much needed fashionable twist to your ensemble. A stylish bracelet will always be a jewellery piece that can add a dash of elegance and sophistication in an instant, so discover stunning bracelet styles in our beautiful collection, pick an exquisite single bracelets or indulge in a few luxurious pieces and sets to achieve a glamorous look with great versatility! Create a contemporary stack with a collection of whimsical charm bracelets, designed with cute heart charms, stars and gemstones or get clever with clashing your favourite metals, how about silver bracelets and rose charm bracelets. Too much? Opt for more traditional bracelet styles with our vast range. 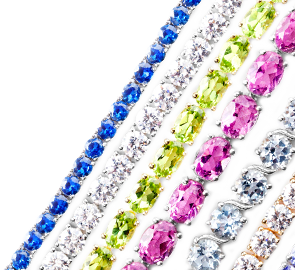 How about our diamond bracelets, tennis bracelets or perhaps something timeless like a gold bracelet? Whatever style you choose to seamlessly fit into your jewellery wardrobe, find something that will fill your heart with glee. Indulge in utterly beautiful bracelets, whether you decide on a rustic Thai Silver design or a stunning bracelet adorned with your favourite gemstones, find it in our collection! This season, update your arm candy with something dazzling from TJC! Choose a spectacularly special design that will endure your lifestyle as well as stay a prized piece in your jewellery collection.